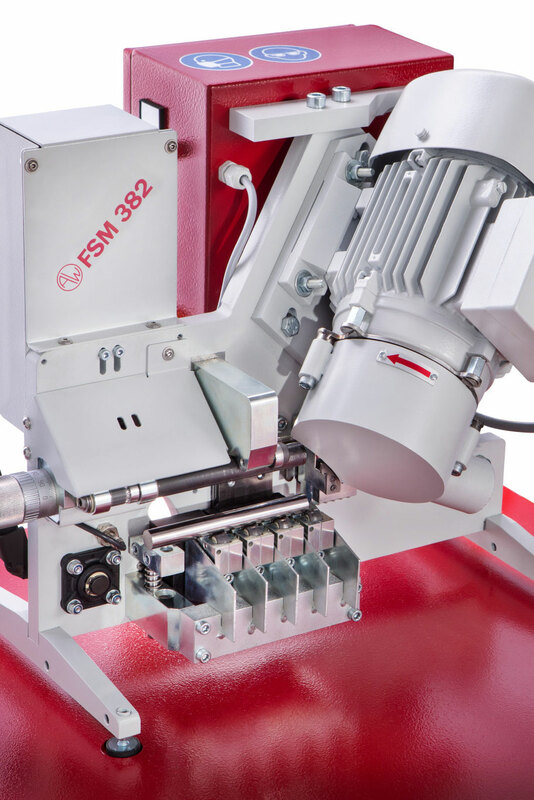 “Just in time for this year ‘s fair the latest Wimmer development was presented with the FSM 382 chamfering machine.“ The universal FSM 382 grinds perfect chamfers on cylindrical tools and work pieces in carbide, high speed steel, tungsten, ceramics and other hard materials. Its fast and easy operation reduces the processing costs noticeably! The machine can be started and operated by the multifunction lever. It is loaded in the neutral position. The lever in the middle position starts the spindle and feeder to grind the chamfer. The final position puts the workpiece automatically into a collecting box. An optional loading magazine enhances handling and productivity significantly! Due to the low material removal no coolant is necessary during grinding. The safety protection of the grinding wheel is fully enclosed with a built-in connection to a dust extraction system (option). This easy to operate and compact machine is particularly suited for smaller batches over the whole range of diameters. With the aluminum profile table on wheels (option) the machine can be operated practically anywhere in the production area.